Would you be excited today to wear clothes that make you feel beautiful? Open your eyes and see the fashion style by Dimitrios Ordoulidis designer of New Generation Fashion Lines for London Fashion Week. Do not miss it. As the London Fashion Week is coming, I love to discover upcoming designers who work with passion and dedication for what they really love to do. For my Fashion Week style, it is not that I necessarily choose to wear clothes with many decorative design details. I also love to wear clothing that has an intelligent and clear edge. I recently met Dimitrios Ordoulidis during New Generation Fashion Lines in Athens Greece and we both got excited to collaborate for Fashion Week style in London. For Dimitrios, clothes have to make you feel beautiful and I’m delighted to share his love for real style. Dimitrios won the first award of the best new designer in the competition “new designers award at 17th Athens exclusive designers week (fashion week Athens). He settled for the Design Departement of Düsseldorf, Germany. A principle that accompanies Dimitri in his career is this: beyond love, design, and fashion is art. “You must prove to the buyer why they should invest in your clothes and no to something just as beautiful .” Another principle that follows him from the beginning of his career is one that was earned from the chief designer Yiorgos Eleftheriades. The four-month practice that he committed in the atelier of the famous Greek designer in Athens, Dimitrios learned that ” talent ” is simply a shade of the whole, but the hard work is the “light ”. How could you wear soft greys add light to your fashion week style? Have you ever thought that darks reveal the secret beauty of neutrals? 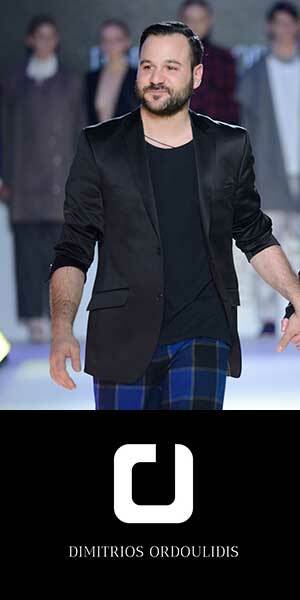 My fashion style by Dimitrios Ordoulidis is a simple look of matt fabrics with minimal details. Afterward, it is about this ultimate feeling of being calm and relaxed. My striped midi-length pants in super-smooth wool look sophisticated and practical. I really love to wear it all day long with my polo neck in the soft ecru shade. In my eyes, soft shades of grey add light and beautiful contract to neutrals. That’s the design balance embraced by the secret beauty of colors.